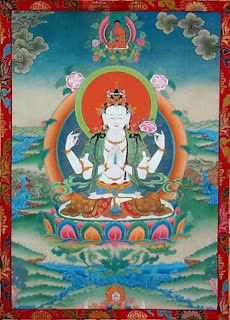 Chenrezig is known by the name Arya-Avalokiteshvara, which means "The Noble One Who Regards the Cries of the World." Chenrezig is considered to be the Bodhisattva (an enlightened being who has vowed to help all other beings attain enlightenment before becoming a buddha) of Mercy and Compassion. Though primarily male in Indian and Tibetan iconography, Avalokiteshvara can appear in any form, and the thirty-three forms are listed in the Lotus Sutra. Many of those forms are female, and it is primarily in female form that this deity is known in Southeast and East Asia, the name varying from Kum-yam to Guan-yin to Kuan-yin to Kannon. Chenrezig is also invoked for healing, often for, but not limited to, problems of a spiritual nature. Historically, it is believed helpful to meditate on his image and to chant his mantra with the desire to alleviate suffering and attain enlightenment. It is thought that Dr. Mikao Usui, the originator of Reiki in its modern form, may have meditated on the Kannon sutra (Chapter 25 of the Lotus Sutra) as part of his efforts to tap into the healing energies of the Buddha. Chenrezig is an enlightened being who has unbiased compassion for all living beings. He protects living beings from physical and mental illnesses and other dangers and obstacles, and helps them to eradicate the three poisons-attachment, hatred, and ignorance-which are the source of all sickness and danger. He is the "Buddha Doctor."